Israel, a country about the size of New Jersey, endured eight terrorist attacks in a four-day period overlapping the American incidents. Even that frightening frequency does not represent "the scale of the attacks during the previous wave" of terror, according to the Meir Amit Intelligence and Terrorism Information Center, an Israeli think tank. Israel's experience shows that the war against Islamist terror is a long and difficult one, but it can be managed while maintaining a democracy's core values. The Israeli government statistics don't include stone throwing, petrol bombs, riots, IEDs, arson, stun grenade attacks, rocket attacks, and other types of attacks. When those are included, Israelis endured 3,754 terrorist attacks (including 3,635 by Palestinians and 119 by Israeli Arabs) from Jan. 1, 2015 to Jan. 5, 2016, according to a meticulously documented list compiled by analyst Nehemia Gershuni-Aylho. Despite those differences, jihadi attacks in the United States during the last year have been enough to inject proposals like banning all Muslims from entering the country into the national political debate. No such proposals have ever been publicly discussed by any mainstream political parties in Israel. By contrast, Israeli democracy is immensely tolerant of diverse opinions – to the point that the Arab party in the Knesset publicly supports terrorist organizations bent on destroying Israel. Last March, two Arab-Israeli political parties condemned Gulf Arab states for designating the Lebanese-based Iranian proxy Hizballah a terror organization. Hizballah openly seeks Israel's destruction, and has more than 100,000 rockets and missiles aimed at the Jewish state. Could a parliamentary party in the EU or U.S. ever openly support an enemy terrorist group? Last December, at the height of the "Stabbing Intifida" – a series of seemingly spontaneous knife attacks by Palestinians on Israelis - the Israeli Medical Association issued a ruling requiring that the wounded be aided in order of injury severity, even if that means helping assailants before victims. Israeli medics treat Palestinian terrorists and murderers better than their Palestinian counterparts treat Israeli victims of Palestinian terror, such as the Palestinian medics who ignored an Israeli terror victim's plea for help last November. Another example of Israel's incredible humanism despite extreme terrorism is the Israeli mother who was happy to donate the kidney of her son, who was murdered by a Palestinian suicide bomber, to save the life of a Palestinian girl. The Israeli non-profit "Heart for Peace" is staffed by Israeli and Arab cardiologists who have saved the lives of more than 610 Palestinian children since 2005. Outrageously, in 2014, a Gazan mother whose young son's heart was saved by Israeli doctors said that she hoped he would grow up to be a suicide bomber. Examples of public generosity and decency may be rare in conflict zones, but they abound in Israel. When an Arab Israeli was wrongly beaten by police in May, the Israeli public raised money for the victim's college tuition and legal fees, a story that went totally unreported by the mainstream media. Last August, a Palestinian girl whose bicycle was taken and broken by Israeli border police received a new bicycle donated by an Israeli man. The EU routinely criticizes Israel for its relations with Muslims, yet Europe is far less tolerant of Islam in many respects. Last summer, three French cities – Corsica, Cannes, and Villeneuve-Loubet – banned "burkinis" from the beach. Germany's interior minister called for a partial ban on burkinis, and a German public swimming pool reportedly prohibited them. By contrast, Israel allows burkinis, a fact highlighted in a New York Times video that went viral. But stories of Israeli decency and the relative prosperity of Israel's Muslims rarely appear in the mainstream media or get acknowledged by the EU, the UN, or human rights organizations. World leaders routinely call for Israeli restraint, as if Israelis weren't already exercising extraordinary restraint, a fact demonstrated by this graph showing how each of Israel's last three wars with Hamas (in 2008, 2012, and 2014) was preceded by hundreds, and more often thousands, of Hamas rocket attacks against Israeli civilians. What country would tolerate thousands of deadly projectiles being fired on its civilians before responding with enough force to stop the attacks? Last October, EU foreign affairs chief Federica Mogherini called for Israeli restraint after four Israelis had been murdered in a total of 19 terrorist attacks during the first 12 days of the month. Secretary of State John Kerry tried to blame that wave of Palestinian terrorism on Israeli settlements. United Nations Secretary General Ban Ki-moon tried to justify Palestinian terrorism as a rational response to "occupation." Such reactions would be unthinkable in response to similar terrorist attacks in the EU or U.S. World leaders and the global media seem unaware that Arab Muslims have been killing Jews for more than a century – long before any occupation, settlements, or even a Jewish state. Palestinian terror attacks don't reflect some miserably unfair existence – they are the product of raw hatred and incitement. 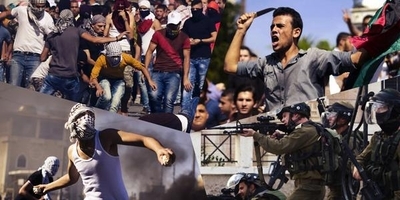 Dozens of Israeli Arab Muslims have committed terrorist attacks even though they are not under occupation and enjoy better freedoms and living standards than most of the Arab world has. Like so many Palestinian terrorists, they are driven by the same hateful incitement that rejects any state for the Jews. The next time Western politicians, human rights groups, and journalists feel tempted to critique Israeli conduct, or demand more restraint from Israelis, they should ask themselves: "How would we respond if there were 411 jihadi terrorist attacks per day here? Would we also provide medical treatment to terrorists and their relatives? Would our society be nearly as tolerant and kind towards Muslims? Would our laws similarly protect Muslim rights and allow Muslim political groups to support organizations that want to destroy our country? How often would our headlines and news coverage present a neutralized terrorist as a victim?"